BRI board for Raspberry Pi is an ideal solution for enhancing Raspberry Pi to a complete telecommunications system for small-sized enterprises. Integrated into the open-source environment, BRI board for Raspberry Pi provides four BRI interfaces in the familiar Asterisk infrastructure. The four available BRI ports allow all types of ISDN integration such as linkage to ISDN networks, integration of existent ISDN systems and much more. BRI board for Raspberry Pi is the worldwide first BRI board available for the Raspberry Pi environment. It has four BRI ports to connect ISDN systems and ISDN networks. 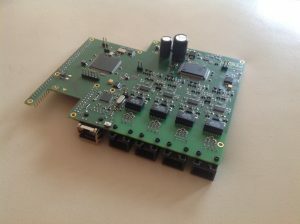 Using an integrated, highly precise 5ppm ISDN clock, BRI board for Raspberry Pi provides ISDN quality for voice, fax and DECT connections. Our BRI board for Raspberry Pi is fully integrated into the Asterisk open-source implementation. The board acts as a typical BRI card with full access to the signaling and service channels of the BRI interfaces based on the Asterisk protocol stack. LinkXess GmbH takes the protection of your personal data very seriously and abides strictly with the laws and principles of data protection. This means that you can visit and search our website at any time without providing us with any personal information. However, your IP address, which is signaled automatically, will be saved for strictly technical reasons. Under no circumstances is collected data sold or otherwise distributed to third-parties. LinkXess has moved to Berlin Adlershof. Our new office is now located in one of the most successful high-technology locations in Germany with more than 500 high tech companies and six scientific institutes of the Humboldt-Universität zu Berlin. The new office location will help us to fulfill our growing strategy with the excellent infrastructure of this area.